WhatsApp—cross-platform messaging app—has clearly brought some of the biggest changes as far as communicate is considered. One can send not only messages but also photos and other such media instantaneously. And this is the reason behind its huge user base on both Android as well as iOS. However, we tend to frequently change our handsets. Every time a new mobile is launched in the market, we grab it in no time. And due to this, we need to transfer WhatsApp messages from Android to Android. In the below article, we will discuss best ways to know how to export WhatsApp messages from Android to Android. Below we will discuss best two methods to know how to transfer WhatsApp from Android to Android in ways. You can choose any one as per your convenience. One of the answers for how to transfer WhatsApp chats from Android to Android is using local backup. The so-called "donkey-work" method is using Email wherein you have to email every chat for each contact and there is no option of doing it in bulk. And so, local WhatsApp backup is a better option than this one. Let's see how to transfer WhatsApp data from Android to Android using WhatsApp backup. 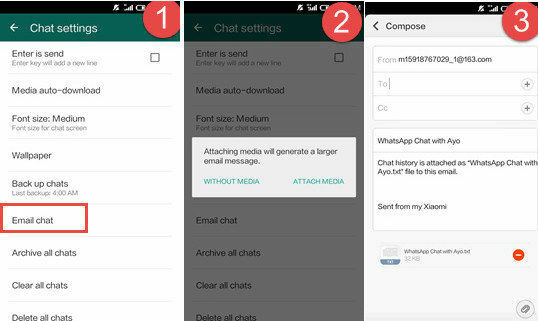 Follow below simple steps to know how to transfer WhatsApp messages from Android to Android. Step 1: Take backup of all your WhatsApp data on the old Android phone. Simply go to Settings >> Chat Settings. Now choose Email Chat option from the drop-down list provided. Step 2: In your previous Android phone, uninstall your WhatsApp. It will not take much time. Step 3: Now in your new Android phone, download and install the WhatsApp. Once the installation is done, carefully provide your original phone number during the registration to your WhatsApp. An alert message will be given stating that a backup is found. Step 4: Once you receive this message, restore the data from backup to your new Android device simply by tapping on option Restore. 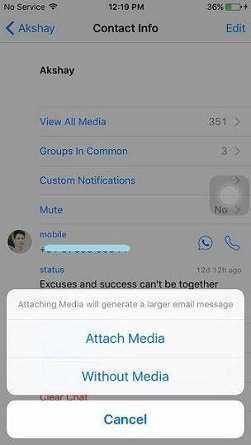 With this, all the backed-up WhatsApp data will be transferred in no time to your news Android phone from the device. The transfer process might take some time if the backup is huge. A built-in element is present in WhatsApp so as to backup all the data using Google Drive. You just need to link your Gmail account with the WhatsApp. With this, you can backup all the messages/chats on your Google Drive. And whenever you want to restore it, all you need to do is sign in on your new Android device to the Google account you have your backup on and just restore the data. Follow below steps to know how to transfer WhatsApp from one phone to another using Google Drive. Step 1: Go to WhatsApp app on previous Android phone and navigate to menu at the top right side. Click on Settings. Step 2: Go to Chats and Calls >> Chat Backup >> Backup. Take a note that your Gmail account is linked with the WhatsApp account in order to upload the backup. Step 3: Choose the Backup over Wi-Fi option since mobile data is not so good option comparatively and will eat up a lot of bandwidth. Beware! you might be charged extra without your notice. Step 4: Install WhatsApp on your new Android device. Now verify your phone number with the WhatsApp account. The backup will be automatically recognized when the app is launched and started. Tap on Restore option to get restore all the data from the old device to the new Android phone. Congratulations! You have completed migrate WhatsApp messages from Android to Android task successfully. If in case while transferring WhatsApp from Android to Android something goes wrong and you end up losing all your data, Tenorshare Android Data Recovery is here for you. It is the best option to go think of while you need to recover all the lost data in any case. You simply have to use Android Data Recovery tool since it is the best option you have to recover all the lost data in any way. 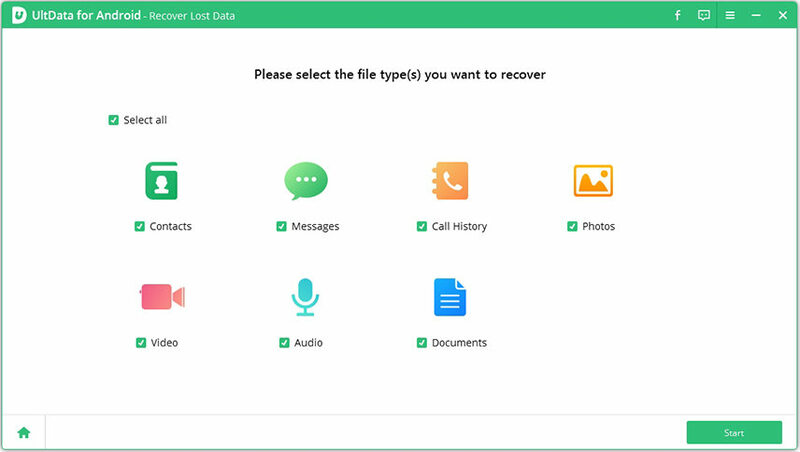 Numerous data types including contacts, audios videos, messages, photos, call history, and other similar data will be recovered using this amazing tool. In the above article, we have shown all the best and possible ways to know how to transfer WhatsApp from Android to Android. Tenorshare Android Data Recovery is the most recommended software to recover all the lost Android data by any means. Feel free to share your valuable feedback in below comments.